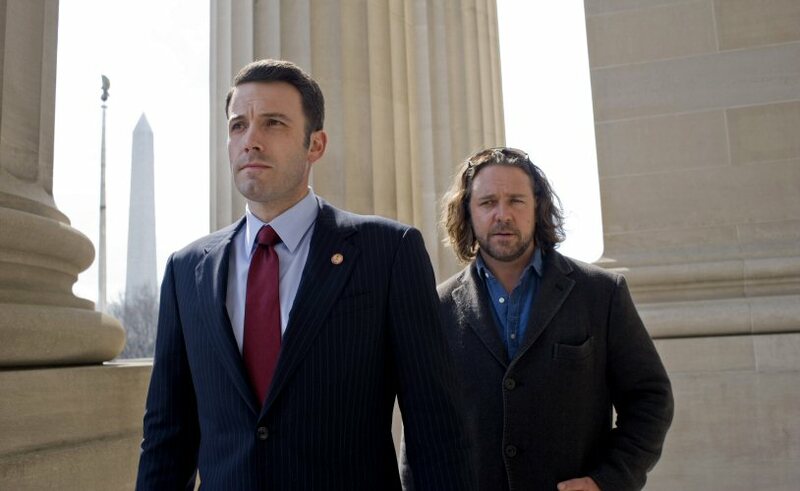 Ben Affleck and Russell Crowe do stuff in the feature film adaptation of the BBC series State of Play. State of Play (2009) is a well-crafted political thriller based on the critically acclaimed BBC mini series by producer/screenwriter Paul Abbott. The US film version is directed by Kevin MacDonald and the screenplay was the work of Matthew Michael Carnahan (The Kingdom), Tony Gilroy (The Bourne Identity), Peter Morgan (Frost/Nixon) and Billy Ray (Shattered Glass). The movie was originally planned as a collaboration with actor Brad Pitt, who is an admirer of Kevin MacDonald’s work (Touching The Void, The Last King of Scotland). Unexpectedly, Pitt left the project due to a dispute over the script and also because he wanted to honor the 2007- 2008 Writers Guild of America labor strike. To save the project, MacDonald traveled to Australia and recruited Russell Crowe for the leading role of Cal McCaffery, an investigative news journalist for a fictional version of The Washington Post called The Washington Globe. McCaffery and his colleagues uncover political and corporate corruption involving private mercenaries working for the US government in Iraq, Afghanistan and America. Co-stars include Helen Mirren, Ben Affleck, Justin Bateman, Rachel McAdams, Harry Lennix and Robin Wright Penn. Affleck joined the production as a replacement after Edward Norton left to work on Leaves of Grass. Consultants for the movie included members of the staff from the Washington Post, US Speaker of the House Nancy Pelosi, US Congressman Anthony D. Weiner of New York, and members of the Massachusetts congressional delegation. Despite many setbacks in the production schedule, the final product is a quality film with an almost seamless script, frank naturalistic dialogue, a dramatic soundtrack and ingenious editing. Paul Abbott was skeptical that his six-part British series could be condensed into a two and a half hour feature film, but after a bidding competition between Paramount and Warner Brothers, he eventually sold the rights to Universal in December 2004. The result is an admirable representation of the political thriller genre featuring a sustained sense of suspense and many unexpected plot twists. The story examines some very serious ethical issues regarding mass media journalism, political deceit and corporate corruption. It also addresses the privatization of military forces and spy agencies in the US. In Crowe’s cynical reporter’s role, he is forced to fight a tough battle with corporate newspaper editor Helen Mirren in an attempt to break news about major political scandals. Rachel McAdams plays his newbie intern who starts out as a gossipy blogger but is finally transformed into a seasoned professional journalist. Questions are raised regarding conflicts of interest at the newspaper and in the US Congress and Department of Defense. Political pressure from the new corporate owners of the Washington Globe, McCaffery’s personal involvement with the subjects of his investigative journalism, and the deaths of several innocent people add urgency to his courageous quest to expose the truth. The music for State of Play was produced by Grammy Award winner “Flood” (aka Mark Ellis). The score was composed and conducted by Alex Heffes, a longtime collaborator with director Kevin MacDonald. They worked together on the documentaries One Day In September and Touching The Void. Heffes also composed the score for MacDonald’s feature film, The Last King of Scotland. Heffes said he composed the music for State of Play around the dialogue. He wrote some of the score before the production had even begun, basing his musical soundtrack only on the written script. The sounds are especially effective during intense scene build ups and at moments of tension, suspense or transition. The crafty visual editing and dramatic musical score work together quite well. Both elements enhance the moodiness of the script and the result is an engaging and intriguing story. I also laughed when Robin Wright Penn tells Russell Crowe that her father warned her about two kinds of men — politicians and journalists! Journalists and conspiracy enthusiasts will enjoy this movie. It takes an inside look into the workings of the corporate news media, defense contractors, and elected officials. As a journalist I appreciated the gritty portrayal of newsroom relationships, including the intense professional rivalries, the typical resentment expressed by reporters towards management’s strict financial policies, and some important discussions about journalistic ethics, including the negative influence of corporate media monopolies on freedom of the press. Some famous reporters and commentators even make cameo appearances: Bob Woodward, Margaret Carlson, Bob Sheiffer, Katty Kay, John Palmer, Lou Dobbs, and Chris Matthews. The political issues examined in this film are well worth considering. Kevin MacDonald claimed it was created for the sake of entertainment. But if that is true, then it is some of the most clever, thoughtful and well-crafted entertainment I’ve seen in a long time.